TAYLOR’S offer completely free pre-sale verbal valuations without obligation, on individual items and collections, at our salerooms or by appointment at your home or other premises. 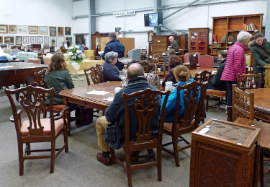 Following your free presale valuation, our valuers will then advise which of our forthcoming auctions would be suitable for the items you decide to consign. We usually recommend that your goods are sold at the auctioneers's discretion, which gives us a 10% leeway on the lower estimate printed in the catalogue. Alternatively we are happy to discuss a fixed reserve price below which we will not sell. Commission rates payable by the vendor can vary depending on the value of the items and will be discussed when the items are valued. However, unlike many of our competitors we do not charge for any item which fails to sell. If you cannot deliver the items to our salerooms we can recommend carriers. In many instances we can deduct this cost from the sum your items realise, please contact us for further information. Cheques are sent out with a settlement statement within 5 weeks of the sale with any fees deducted, in accordance with our terms and conditions. 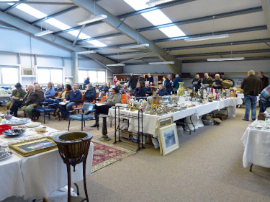 TAYLOR’S as an agent provide a fast, friendly and professional service for the sale of items at auction. We are proactive in attracting potential purchasers to the saleroom, and have an efficient marketing strategy which incorporates this website and other major collectors’ sites, through our extensive database of catalogue subscribers, specialist buyers and existing clients, in addition to our advertising and editorial in international collectors’ and trade publications and local newspapers. We are confident clients will be pleased with the service TAYLOR’S provides in the marketing and selling of their items at auction.